You get to know the market penetration of IO-Link until 2016 regarding number of users of IO-Link, their market share at all machine-builders, number of machines equipped with IO-Link, their market share at all machines and number of the implemented sensors/actuators with IO Link. You get to know the growth sectors of IO-Link until 2016 as well as the sectors IO-Link is particularly intensively to be used in until 2016. You get to know how the users of IO-Link evaluate nine aspects of benefit of IO-Link and which references these users have to the suppliers of IO-Link regarding improvements or modifications. You get to know the reasons of the machine-builders against the use of IO-Link until 2016 and how stable these rejections really are. You get to know the main suppliers of the sensors/actuators, the sensors/actuators with IO-Link, which role the end-user plays regarding the use of IO-Link and the sources of information, machine-builders are using for their evaluation of IO-Link. The study serves as roadmap for the direct and successful market processing and the contentwise managing of the market communication. 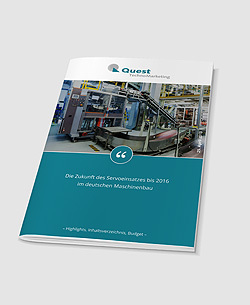 83 pages, 35 figures, 29 tables, 230 statements of machine-builders, cited according to sector.